The depth caliper is a specific model of calipers. The depth caliper is applicable to measure the depth of mortises, bore holes, blind holes, steps etc. A special characteristic of the caliper is its large measuring bridge that prevents almost completely a tilting of the caliper and thus prevents any measuring aberrance. 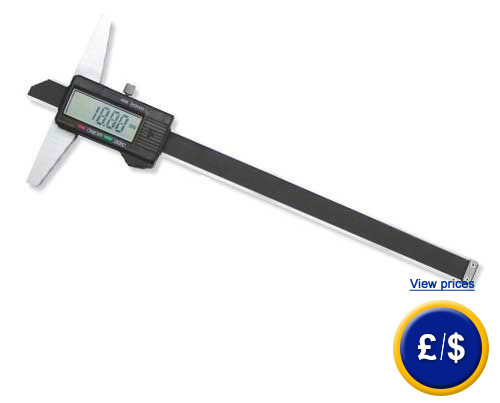 With its large LCD display the measuring value is directly and without any problems eligible from the depth caliper. A zero adjustment is performable at any position of the caliper. Therefore the caliper can be used due to its locking screw even as a depth caliper. Furthermore the measuring indicator is always selectable between mm and inch. If you have further questions concerning this depth caliper, please take a look at the following technical data or call our Hotline: UK customers +44(0) 23 809 870 30 / US customers +1-410-387-7703. Our technicians and engineers will gladly advise you regarding the depth caliper PCE-DCP 150S or any other product in terms of regulation and control or scales and balances by PCE Instruments.